Your child deserves the very best. At the East Hanover Cooperative Nursery School in New Jersey, we offer affordable early childhood education programs and preschool classes that establish fantastic social and academic foundations. Each class has a teacher and at least one assistant with a low teacher to student ratio. Morning Session: 9:00 a.m. – 11:30 a.m. Morning Session: 9:00 a.m. – 1:00 p.m.
Our yearly tuition can be paid either monthly, bi-annually, or annually. If you choose to pay in 10 monthly installments, you will receive a tuition envelope each month. You will be asked to return the envelope with the tuition payment by the 15th of the previous month. 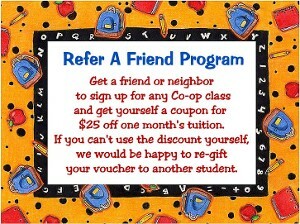 If you have more than one child enrolled at the co-op for the school year, you are eligible to receive a 10% discount on the lower tuition. Click here to view our Parent Handbook. Contact us at 973-515-0477 in East Hanover, New Jersey, for the very best in early childhood education.